Grabbed a few NMR today. Really hoping to add to my XMR and FCT position soon but thin on FIAT. EOS ICO is intriguing but Terms and Conditions of coin are quite scary. People need to quit doing these stop losses. A mentor of mine who is about 65 lost $17,000 during that stock market flash crash back in 2015. It's even stupider with the crypto currencies since they are free from any SEC-type regulation. This past weekend I didn't check the prices at all and my grand total of 2 ETH's and 1 litecoin lost about $200 in value. Boo-hoo. My intention is to hold these until one year from their purchase date. Back when people were buying illegal drugs and paying out bonuses the IRS couldn't track with bitcoin, it was actually being used as a currency. Now that you can't really buy anything with bitcoin or ETH that you can't with regular cash, they have no special use and everyone's just speculating. I'm just going to leave this link here for all of the "Vanguard Index Funds or Bust!" people coming in here and blabbering that cryptocurrencies are a joke. That's because there's more to Blockchain technology that you haven't educated yourself on. I can only give you my opinion and suggestion that you should, at the least, learn about them. Blockchain Technology will have a very large effect on many industries. IMO this is one of the greatest investment opportunities of a generation. But there will be risks, scams, and security measures we will have to wade through. It's absolutely speculation, no doubt. But money only has value if everyone agrees it has value. There are some unique properties of cryptocurrencies (decentralization, limited supply in some cases, etc.) that people seem to agree give them value. So here we are. The block chain is great. That doesn't mean the currencies will necessarily have any value. Etherium the block chain will be successful. That doesn't mean ETH the currency will, they're two separate things. I bring it up because I believe the blockchain technology is the underlying important part of these "cryptocurrencies," and that a lot of people do not understand that. A lot of people, especially ones that instantly dismiss crypto as valueless magic internet coins, have not delved into the technology behind them and how it could possibly be disruptive. You are absolutely correct that a corresponding digital "currency" or coins made on top of a blockchain will not necessarily have value. There are ALOT of cryptocurrencies out there and many are a joke, or a scam. Many will eventually be worthless, although they have a USD value tied to them at the moment. ALL of the current cryptocurrencies out right now, including Bitcoin or Ethereum, could be valueless at some point. But there are many of these distributed ledger technologies that have different porotocols looking to be the one to change certain industries. You and I know, Ethereum doesn't even consider itself a currency. It just has a protocol for "gas" (Ether) and these are what everyone are trading. But others may not know that. I thought some might could benefit from the link, if they are curious. Also, the title of the thread did say "Blockchain / Crypto-Currency Portfolios and Discussion." Don't post here much but since I've gained so much valuable information from the site, though I'd give back a little. Blockchain technology is possibly the next paradigm shift in technology. Everyone wants exposure to the next internet/mobile phone/integrated circuit/assembly line. The problem with blockchain technology is that it isn't clear how to get financial exposure to it. Buying BTC or ETH may get you there, it may not. Think of it as believing cell phones being the next big thing and buying stock in Nokia. The difference is that if the cell phone failed, you still have an investment in a real company making other products. With cryptocurrencies, you're presumably going to be left with a worthless digital asset. I have around 10% of my portfolio in crypto right now and plan to hold for at least a few years. My view of this is if you're really convinced that a general technology (blockchains, AI, 3D printing, drones, CRISPR, robotic warehouses, or whatever else) is going to change the world the only way to really get exposure to it is to develop expertise in the field. As your Nokia example points out, it's quite easy to be right about the technology but for none of the publicly traded companies working in the area when you make that realization to be good investments with the benefit of hindsight. Groundbreaking change the way people live their day to days lives stuff tends to either come out of startups (privately held until after most of their explosive growth has already happened) or giant companies where the impact of some amazing new advance that comes out of one of their R&D units gets averaged out with a huge amount of other business as usual economic units before it filters back into shareholder value. FWIW, I agree with you that blockchains are going to be, in fact are already becoming, a game changer, regardless of what happens with the current batch of cryptocurrencies. So do people here believe that blockchain will allow banks and other entities with a lot of IT staff employed in security to significantly reduce their staffs? If so, it portends a significant long-term productivity gain. But as a poster just noted, if there is no "blockchain company", then there is no specific place in which to invest. Have you thought about getting exposure through AMD or Nvidia? I don't know that blockchain technology would be possible without GPUs. That also gets you exposure to VR and some of the deep learning technology that rely on GPUs. Companies that sell cloud computing (Amazon with AWS or Microsoft with Azure) might also have exposure. I've read that AWS could profitably mine currencies if they reach certain price points. You can also get exposure through the companies that plan to leverage the blockchain or stand to otherwise benefit from it. I'd start by looking at the companies in Enterprise Ethereum Alliance. I'd be interested to hear of other ways to get exposure. If cryptocurrencies do become a big part of the economy, a basket of those stocks should capture much of those growth with much less risk than a basket of the cryptocurrencies themselves. Having said all that, I'm still 100% index funds, but it's all fascinating. Just planning to hold. I want to buy some more BTC, missed my chance this week end the price dipped, but I didn't have any spare cash. I experimented with mining a few years ago. I purchased two Antminer S1s from eBay for $700 shipped with a power supply. I ran them for about 8 months, generating about 2.5 BTC. Then the price started to plummet and my mining was losing money (electric cost more per day than I was generating in BTC), so I stopped. The market kept falling and it seemed like everyone was loosing faith in BTC, so I decided to sell about 2 BTC so I could at least break even. I also sold the miners on craigslist for $100. Regretting those decisions now! Was thinking about emailing the guy that bought them to see if he still has 'em. The generation scheme seems crazy to me. Just burning up electricity to compute useless hashes. not every token is mined (ie. XRP (ripple) - their protocol is based on consensus. depending on who you talk to (99% of the "crypto-anarchists"), they're considered a travesty to this "new world", despite having the fastest and most innovative technology. Please don't come and shill XRP in here bud...lol just kidding! Do you guys have any resources to learn more about the different cryptocurrencies? I just got in (BTC and ETH) yesterday with a tiny fraction of my portfolio and my position is already 25% up. It doesnt make any sense to me that there are such big swings. My plan is to increase my position to maybe 5-10% of my portfolio because I feel there is something there but I want to get a better understanding first. Is it too late to invest in Bitcoin? Have I missed the train and should focus entirely on something like Eth? Or is it worth starting a small stake? Obviously I would recognize that this is speculative and there are no guarantees. Of course like any Mustachian I would prefer not to lose my money entirely. Can I use stop/losses effectively to hedge against risk? If so what % do you set them for so that they're not constantly triggering in response to market volatility? Do stock strategies apply to this market? For example should I dollar cost average a set amount every month? Is it worth learning about the lesser known coins or do you have to be a computer expert to understand them? Awesome, thanks for the links! The whole problem with Bitcoin is that it might experience a first-mover disadvantage. Ethereum is the first competitor to really rise and start challenging it. Also, as I mentioned previously, the cryptocurrencies can't really buy you anything right now that cash or paypal or whatever can't. Bitcoin was actually being used as currency when Silk Road was up and during the brief period of time when the IRS didn't notice companies paying bonuses with Bitcoin. At any moment some new window might appear and the cryptocurrencies will be able to do something cash can't. Or it might never happen. This is the second time you've mentioned that. I'm not sure why you think it is the case. 1) You can buy everything on the dark web that you could before. Just because one marketplace (Silk Road) is gone doesn't mean there aren't other places to buy the same things. 2) Cryptocurrencies have apparently been useful in countries with massively fluctuating, hyperinflating, or restricted currency (e.g. Venezuela) or places that have eliminated cash (e.g. India). That's a use for it that cash can't do, because cash doesn't exist or is close to worthless. I had not thought of #2. Probably useful in some situations for people in unstable areas, but then again, relatively few people have much money in poor countries to begin with, and those that do are more often than not up to no good. As for #1, I have no first-hand experience. I am acquainted with people who did use silk road and because of the working knowledge they gained a few years ago they were early adopters of Ethereum and one bought $5,000 back in early March that is now worth about $30,000. However I don't think any of them are actually using Bitcoin or Ethereum to buy or sell stuff anymore. I know someone still using Bitcoin to purchase things online that they shouldn't. It's definitely still being used for that. However I don't think any of them are actually using Bitcoin or Ethereum to buy or sell stuff anymore. Ether (the token of Ethereum) is not, and never was, intended to be used to buy or sell "stuff." India runs on cash. According to Bloomberg, “India has among the highest usage of cash across global economies,” accounting for up to 98% of all transactions. Modi’s bill ban took 86% of it out of circulation, instantly. When he announced the ban on October 8, he gave just four hours notice. To put this in perspective, consider that India is nearly as populous as China, and struggles to formally document or ID citizens in rural areas, many of whom don't even use surnames. Banning banknotes in India is like banning coins in a penny arcade and expecting it to stay in business. Of course any usuable tool, i.e. cryptocurrency, is going to get sucked in to fill the vacuum. For most people suffering under this kind of high-handed meddling in their lives, cash is not about running a criminal enterprise. It's about staying afloat. There are many blockchain companies, trying to create and apply technology in different fields (mainly financial), they are mainly (or all) privately held startups, small businesses, etc. And most will probably die before you hear of them. The obvious question with certain things like this factom becomes: why can't another currency just duplicate it, and be used, if it becomes too expensive, thus capping the amount it'll grow? Example: A big bank has 1,000,000 clients. Every day the bank needs to time stamp the status of its clients’ accounts, in an immutable way, with the possibility of segregating that data afterwards. Let’s assume 1 EC allows one to store the data of 1 client. You need 1,000,000 EC = 1,000 USD = 111 FCT. Over a month time, 111 * 30 = 3,330 FCT are burned for this sole purpose. As the supply is 73,000, you need only 73,000 / 3,330 = 22 entities to operate at this scale to consume the full 73,000, causing the total number of FCT to shrink substantially. To this example, add the demand for FCT triggered by the Bill & Melinda Gates project, and also the DHS security project, the Chinese smart city initiative, the dLoc project, etc. And this is only the beginning! Of course, this exercise is done by keeping the price constant. The huge amount of demand for FCT will make the price skyrocket. In fact it has to, in order to prevent deflation. Keep in mind that very large institutions are in discussions with Factom and about to sign contracts. Plus, the Harmony suite was probably made with the help of big actors in the industry to get a tailor-made product. (Factom has a number of former exec-level real estate movers on their staff.) The take-away is this: the more companies that use the Factom protocol, the higher the price of FCT must climb. Okay, so let's say a bank IS using a blockchain like this (which I think they will). Why would they use FCT? They can just create another blockchain, their own. A BofA blockchain, and a Wells Fargo blockchain, etc. Or there could be a "Banking" blockchain and a "medical" one, or whatever. But when the price of FCT rises above the cost of just using another blockchain, why would anyone keep using Factom instead of a different one or recreating it? ^Yes, I have had the same question. What's interesting is that it puts us 500 years back, when early banks issued their own currencies. I'm curious if you're tracking/estimating your electricity costs and including that in your graph? I think this could be one of those things like uber, where some of the "hidden" costs wipe out a significant portion of the return. It's even worse if your rigs are in an air conditioned space..
t's a good question. Electricity is a bit messier to track but based on my back of the envelope calculations I should be only spending an extra $25/month on electric if I achieve 100% uptime. My next monthly bill will be almost a complete month of mining, so I'll compare that to what I spent last June is see if that back of the envelope math is in the right ballpark. If so I'll probably put that in as a monthly deduction to the graph. To put that in context it's between 5-10% of the monthly income the mining rig is throwing off at the moment. Mining rig is in an unused corner of the basement which stays quite cool even in summer (include the summer I went three months without a working AC), so my guess is that it isn't making my AC work any harder. If the experiment lasts will winter I may relocate the rig to an upstairs part of the house to harness the waste heat. But again I expect the effect of reduced heating costs, if any, to be too small to quantify. Here's the updated graph. 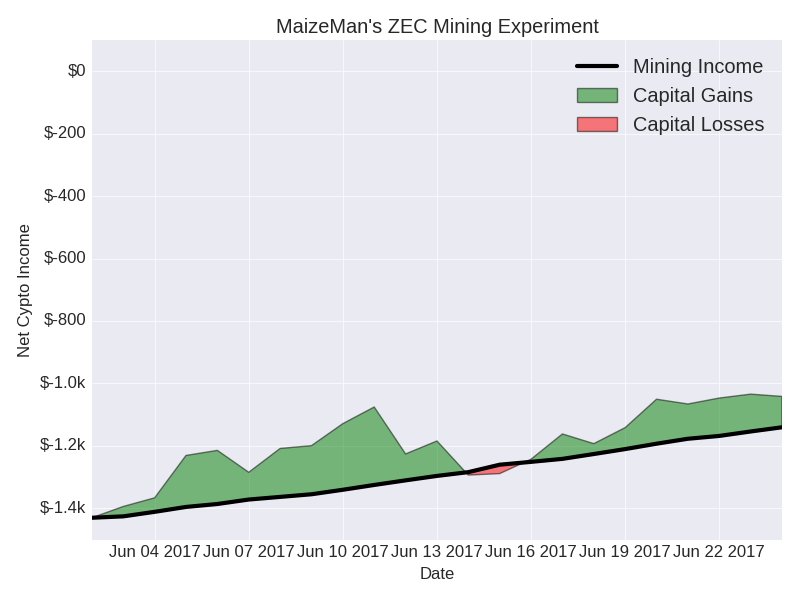 As you can see the recent decline in price for both BTC and ZEC is definitely having an effect on cumulative capital gains. On the mining side, my average daily earnings over the last week were 1/3 lower than the prior week. Anyone tried lending on the call market for BTC? I've know about cryptos for a long time but never bothered to get in, though I'm starting to consider taking a position as a portfolio diversifier. Rather than buy/mine and hold for appreciation in the long run I'm interested in generating a yield from them with lending. Seems potentially extremely risky though, more than just holding such volatile currencies in the first place. t's a good question. Electricity is a bit messier to track but based on my back of the envelope calculations I should be only spending an extra $25/month on electric if I achieve 100% uptime. If you are curious maybe borrow a killowat electricity monitor from someone (might affect your up-time to plug it in and out). I've heard some libraries lend them out to people. They are also cheap to buy, if you anticipate future use. I'd be curious to see electricity usage included in your charts. Your question reminded me that I actually own a kill-a-watt meter from an efficiency kick about five years ago. Followed me through three different states and I don't think I've taken it out of the box since the first time it was packed (until this evening). Thanks! 86 watts just from turning the (dedicated mining) computer on. 356 watts once I start the mining software running. This is only three GPUs. The other two are in a computer that needs to stay online anyway. So let's budget those at the same marginal wattage per GPU (356-86)/3 = 90 watts exactly. So total wattage would be 356+90+90 = 536 watts. 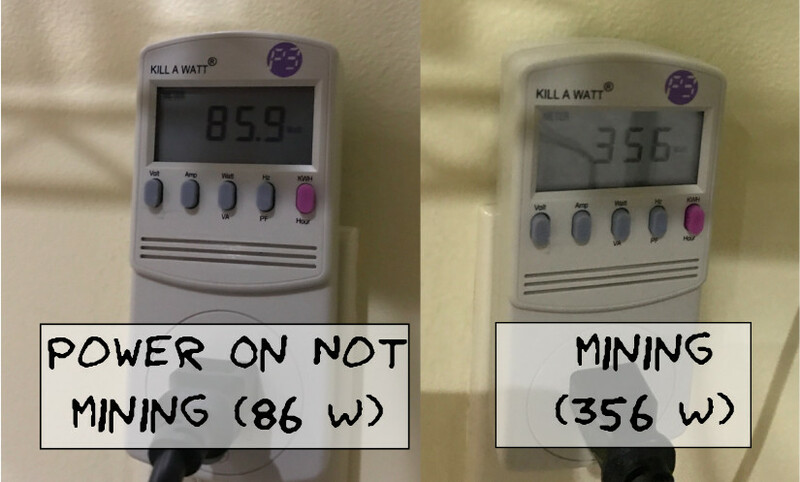 (536*24)/1000 = 12.8 kilowatt hours day. I'm paying ~$0.085/kilowatt-hour so that's $1.09/day or $33/day. * A bit higher than I estimated but the right order of magnitude. Corrected chart below. Here's a list of companies that are exploring blockchain technology. Granted, it's probably a small portion of their business, so it's not even remotely close to a pure play on blockchain. Little scared when I look at the stack of empty video card boxes in the corner. I really hope I can make enough to pay off the initial investment and let the rest ride. Current estimates is about a 4 month break even. Wow! You're at ~10x my target daily income, but if you make it past break-even that starts to become serious money (my target is more just beer money). Good luck! Both my son and us have 17 bitcoins each. These were obtained by mining. A few years ago some friends of ours lost 5k because my son kept telling them not to leave their coins at the exchange but they did not listen and lost it all. I have 6x gtx 1060's dual mining Eth and Sia. I'm running on 492 watt's ang get 123mh/s hash on Eth and 960 mh/s hash on Sia. I see a lot of potential in Sia. i don't mine SC, but think it was a great move for them to release a miner. they also have a super strong/active dev team. Question for Canadians with a crypto-currency portfolio. I opened a coinbase account, but for methods of purchasing, it only lets me use Visa or MasterCard? There is a 4% fee, and i'm not sure what my credit card will charge (like a cash-advance fee) if i use it to buy. Also, how do i get my money out? Back through my credit card? In the last three weeks a few of the high flying altcoins have lost close to half of their value. I'm sure there's a website somewhere that makes this same sort of graph, but I find it's useful to put the recent declines in the price of Ethereum and ZCash in a bit of context. 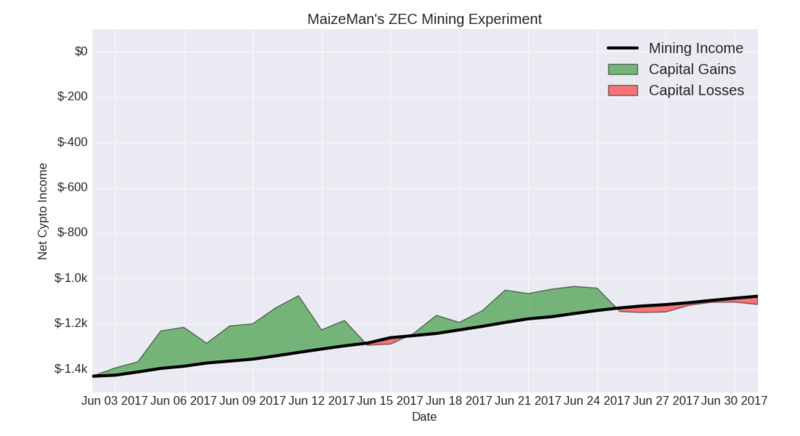 Essentially ZEC, ETH, and DOGE are behaving like high beta stocks. When bitcoin is going up, they go up even more. When bitcoin goes down, they drop a lot more. So let's talk hypotheticals, for a second. How much would you be willing to gamble/invest (whichever term you prefer) on this? Typical "rule of thumb" is speculate with no more than 5% of your portfolio. So I was thinking about this in terms of real numbers. I'll use some large round numbers to illustrate it. Let's say you have 1MM. 5% of that is 50k. Alright. So say you take 50k, and split it among 3 Cryptocurrencies. 16.67k each. Let's say one of them grows 1000% (10x increase). It's now worth 167.67k. We'll pretend the others hold their value (likely if one goes up, the others will too, but we're granting a pretty large increase. You can maths it so one goes up 500% and the others 250% each, or whatever, but either way, let's say it essentially equals out to 10x total increase on 1/3 of it). You've made 150k profit, yay! But you risked 50k to do it. If cryptocurrencies as a "thing" don't pan out (and again, correlated), and all three go to essentially 0, you lose it all. Is it worth risking 50k to make 150k (3x on your money)? Do you think 3.3 to 1 odds is a good payoff for betting that you'll get a 10x increase rather than a (mostly complete loss)? Now all this math hinges on the fact that I set up the scenario as you splitting your investment. Naturally if you have it all in one, the whole thing could 10x (and your 50k could be 500k), but if you have it all in one, and you pick the wrong one, you're more likely to go bust, and less likely to have it go 10x than if you have it split. Say Factom is chosen tomorrow by banks. Or Siacoin replaces Dropbox/cloud storage. And they 10x. But you were in ETH. So to increase your change of 10x, you split it, but in practical terms, that means a smaller part of your bet is in the part that 10x's (i.e. only 1/3 of your amount invested, in this case, rather than the whole thing, which reduces your payout from 10x to 3.3x). The risk v. reward doesn't seem quite worth it to me, especially when I put it in actual numbers. This is putting aside mining. That's strictly a question of "will the payout I get be more than I spent"? I'm talking about holding and/or buying cryptocurrencies for appreciation purposes. i don't think the "risk 50k to make 150k" scenario is worth it. but if a particular cryptocurrency does make it big and survives/thrives for decades, especially an "eventually deflationary" currency, i think the 10x growth number is way too low. that improves the upside of the gamble/invest scenario. if you're talking about holding established coins for multiple decades, as opposed to trying to catch a newish coin make 10x gains in a single year, you should be able to watch the trajectory for each coin. whether it's seeing how that coin's mining system works over several years, how quickly security problems get patched, how chain forks and upgrades are handled, if scalability appears to be on track, how/if the coin is being regulated by governments, how the coin's price responds to stock/bond market crashes, etc., it probably won't be a big surprise if a particular coin positions itself for long-term survival. also, the network effect could theoretically lead to several coins gaining a large user base and becoming entrenched. on a related note something like the Bit20 "index fund" of multiple cryptocurrencies might be something to look into. related to long-term bitcoin holding, the next few weeks could be very interesting. signaling and upgrades and potential forks are on the table. if things don't go well bitcoin (and other cryptos) could get pretty volatile. i plan to just ride out whatever happens and not spend any coins until the dust settles. I agree. It's helpful to remember that bitcoin only hit dollar parity six years ago, so in the last six years its return has been ~2,500:1 not 10:1. Who is to say if the cryptocurrency world will ever see anything like that rate of return in the future,* but I think the folks who are buying up currencies and hoping for appreciation was imaging something on the same order of magnitude. *And past performance is obviously no guide to future returns. But by the time it has that years and years of history, it'll be mainstream enough to have the majority of the price gains already done (the people who took the earlier risk get the higher rewards), so you can hold for some sort of diversification, but why would you expect crazy gains at that point?